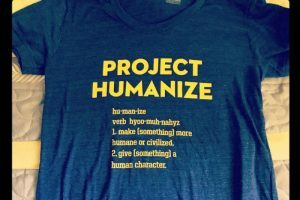 Janette Mochnacz and Alexa Schwartz join GutwiZdom this week to chat about their movement, Project Humanize! Thanksgiving weekend is the perfect time to look outward and create ways to help those that are less fortunate. This week on GutwiZdom, Janette Mochnacz & Alexa Schwartz join Deidre and JG to chat about courage, gratitude, and Project Humanize! Project Humanize is a movement that was created to humanize and de-stigmatize people who are homeless through conversations, photojournalism, and other advocacy efforts. Janette and Alexa tell their stories to break stereotypes and to humanize the individuals that many of us may walk by each day without a second look. Check out their blog here! Listen to this episode to hear some incredible stories from Janette and Alexa and what we can all do to get involved and make a difference in someone’s life! Any act of kindness is important. Showing kindness doesn’t cost anything and it can really make a difference in someone’s day. Stop and say hello. Just letting someone know that they matter can make all the difference to someone who might otherwise go unnoticed. Give a meal to the homeless. Buy an extra meal at dinner or give away your leftovers to someone on the street. Homelessness doesn’t discriminate. Remember that the people that you see are human and homelessness could happen to anyone. Withhold judgements. Not all homeless people fall in to the stereotypes. Helping others causes a trickledown effect. If someone sees you helping the less fortunate, they will join in too! Create care packages. Join the GutwiZdom team to put together packages with non-perishable food, water, socks, and first aid kits. Email DK@GutwiZdom.com to get involved!